When I say this is easy--it really is. This picture was snapped in a hurry as my family was waiting to consume the dish. It is one of our favorite quick meals. I use this recipe for my leftovers in the refrigerator. It is not uncommon for my kids to eat pasta with "red sauce" at least 3 times a week. They love it. Red sauce is any kind of Italian sauce. We make ours from scratch but using a jar brand is okay too. I always have zucchini in the fridge. We use them for our spiral salad, as noodles (see the marinara recipe) and in smoothies. I just find that when I get down to two zucchini's it is almost not enough to do much with them. I ground one pound of hamburger with 1/4 cup diced red onion, 2 cloves of fresh minced garlic and salt/pepper at the beginning of the week. This saves me a ton of time on busy nights to have this combination already pre-made and ready to go. With this basic ground beef mixture, I can whip this casserole up, add taco seasoning for taco salad, add it to a soup or make a quesadilla for the kids lunch. I know that some may find that a casserole is cheesy and creamy. Well, I love those types too but we are trying to cut back on that and so this is the closest I get to cheesy--a little bit melted on top. Whats with the guacamole? Again, another leftover in the icebox. It was awesome with each bite. The zucchini had a bit of a bite and the guacamole was smooth and creamy. Hey, there is that casserole yumminess right there, in the guacamole. 2. In a small casserole dish (7X11) line up the halved zucchinis on the bottom of the pan. 3. Sprinkle the meat, then pour the sauce, and add the cheese. 4. Cover with foil and bake for 25 minutes. The idea is to steam/cook until the zucchini is tender. 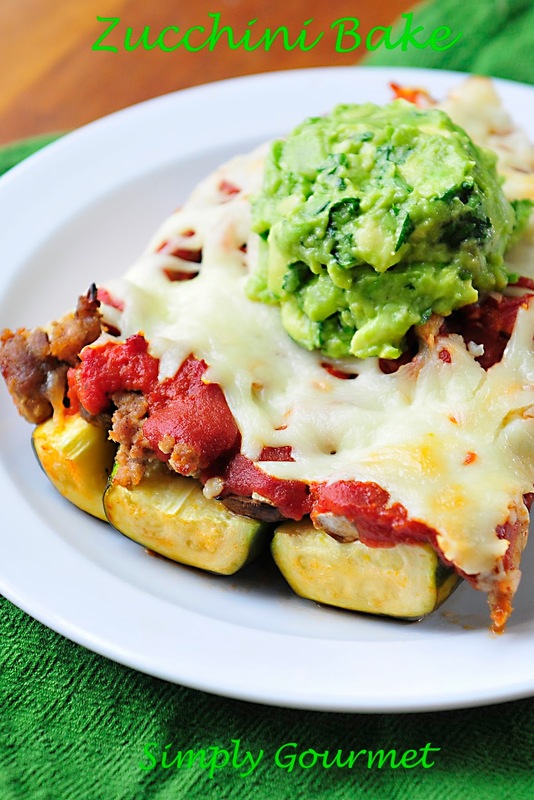 The zucchini will produce a small amount of water at the bottom of the dish when baking is complete. 5. Remove from heat, serve and top with guacamole. I'm thinking you left out a word in this sentence, because I don't see in the recipe where it says to cook the hamburger? "I ground hamburger with onion, fresh garlic and salt/pepper at the beginning of the week. " Am I right that the ground beef is browned before you layer it into the casserole? Hi Kayln, yes. I will change that so it won't be confusing. For the casserole, I was using up left over premade ground beef I already have in my refrigerator. I will try to make that a little bit clearer. Thanks for the questions. Sorry it took me a day or two to respond, I have been out of town.